Hello! I am not sure about where you live, but my town is blooming with flowers in various spring colors these days. Spring and early Summer is finally here! I thought it would be perfect to create something fun, simple, and adorable for this colorful season. Altenew released a wonderful line of brand new stamps, dies, mask stencils, and papers today and one of the stamps totally grabbed my attention. I wanted to make something that is full of color that screams spring with lovely shades of colors. This tutorial and project I am about to share is perfect for beginners and also great for seasoned stampers that want to whip something out quickly. Make sure to watch the video about for a close up on how I created today’s card. 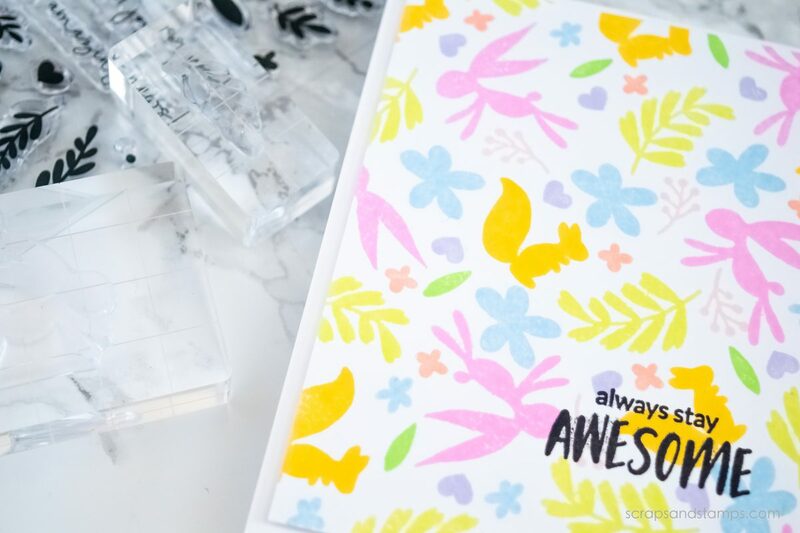 This 4×6 stamp set I used is full of whimsical, cute, and small images. This type of images is so great for creating your own background and have a unique arrangement that fits your style of crafting perfectly. I decided to choose a couple of larger images and a few smaller images to get the balance of the background. To go with these images and the Spring theme I was hoping to achieve, I decided to use pastel tone colors and chose the lightest shades from a few color families from Altenew. See my supplies list below for full-color ranges I’ve chosen. I went with soft pink, soft yellow, soft blue, soft green, and a few other shades to add some depths and interest when creating the background. I kept the sentiment super simple and sweet, just chose a greeting from another stamp set from today’s release and stamped it in black ink. 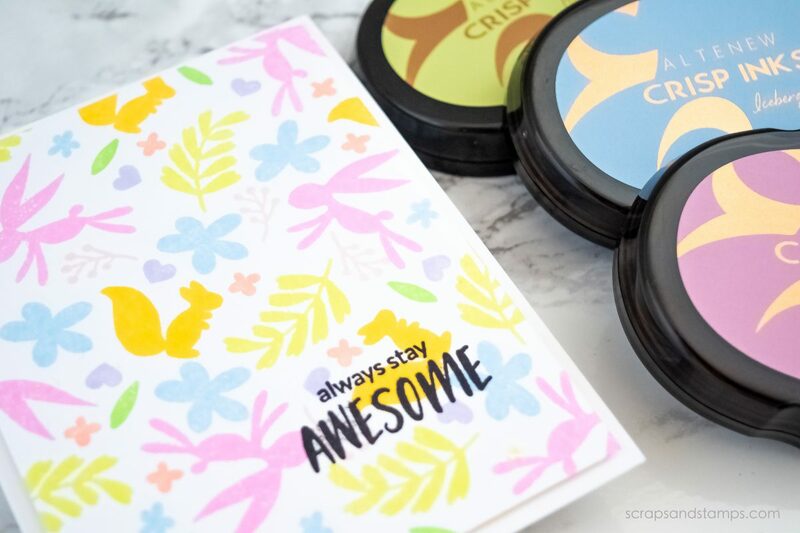 I hope you give this simple stamping technique a try to create your own background. These are so easy, quick, simple, yet bring awesome results to your projects! What is your top 2 pick from today’s release? Make sure to leave a comment below, I’d love to hear about your favorites! You will automatically be entered into a giveaway when leaving a comment below. Altenew is giving away SIX $50 gift certificates to Altenew store! Make sure to visit their blog and leave a comment to win. My blog readers get another chance to win a $20 gift certification to Altenew store! Please leave me a comment below by May 3rd, 11:59pm PST. All winners will be announced on the Altenew blogs on 05/04/2019 Good luck!! I am participating in a fun blog hop to celebrate today’s release! Next stop on the hop is Zsoka Marko! Make sure to stop by and leave some love for her! Please see below for the full blog hop list. Love the background you created! Love this card. It is so sweet and simple and amazing! The images are just adorable. Love the new release. It is fabulous! I really love how you used the colours for this card. too sweet. Love this Spring themed card Nicole! this stamp set is slowly but surely climbing my shopping list! Thanks for the inspiration! Beautiful card. I love the squirrel and rabbit background. Great job Nicole! Love the new release and this card! How pretty!! These little images create a fabulous background! 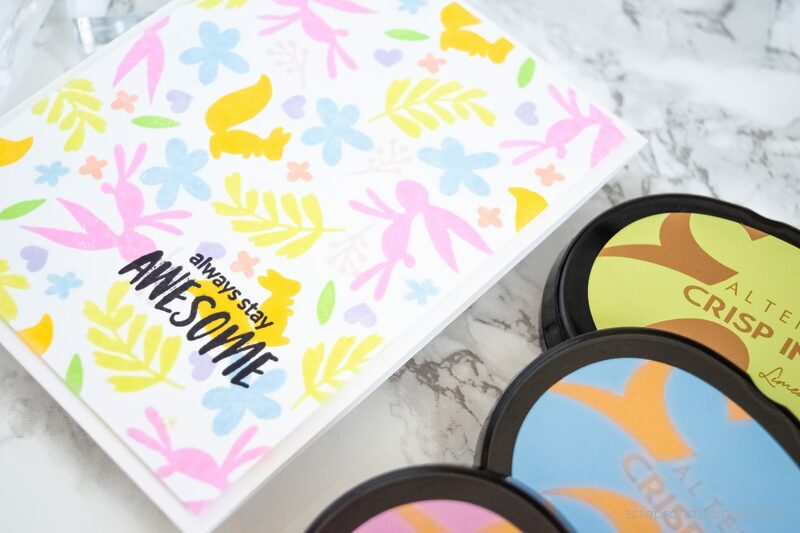 Love your card full of spring colors. Love the combination! So fun and spring-like! Fantastic! 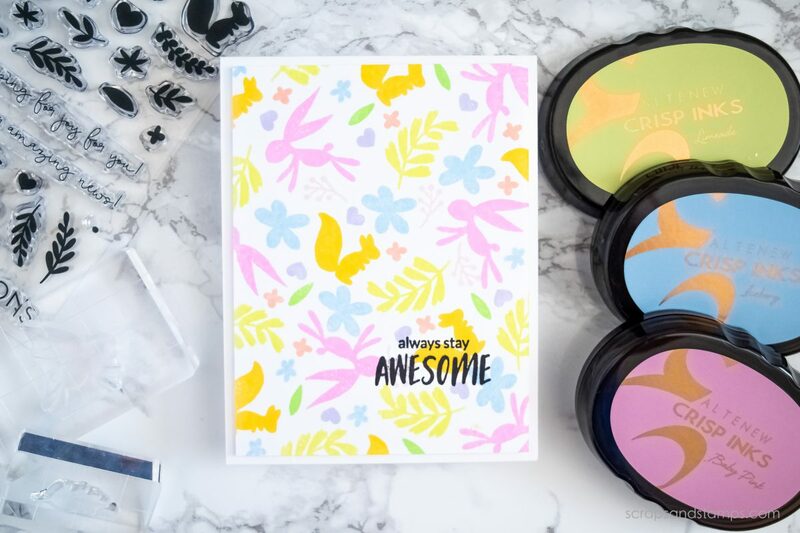 Loving this new release – especially the beautiful rose spray stamp set & that fancy hello die. Thank you for the lovely inspiration! So spring and I love the sentiment, nice job! This set you used is one of my favorites! Love the whimsical bunny and squirrel. Your card is so pretty, full of Spring colors. Beautiful cards as always!! Great Hop, amazing stuff! Awesome Release…. I love the colors you used on the card! It is fun and so different! Love the fresh bright colors used in your cards!! Very springy! A great job on all the different colors on your Easter Card. Almost matches your nail colors! Like the way you used a triangle shape when putting the stamps on your card. Such a cute and colorful card. Perfect for spring! I have always been a huge fan of Altenew products, thanks for sharing your amazing work! I was thinking I didn’t like this set as much until you created the perfect Easter /Spring background using them! Love it. I love the new Fancy Hello die and the Be Kind stamp set. Also fun new patterned paper. I love how you created your own background using the new stamp set from Altenew. It turned out darling. Thanks for sharing your time and talent with us. Your card is so soft and sweet, Nicole! Thanks so much for sharing the wonderful inspiration! Sweet card using those small images to create your card! Beautiful work, I love your cas white space look! Squirrel!! Yummy card! Love the sweet spring colors you used! Such a lovely spring feel to this! I LOVE the light colors on this card; just adorable and so perfect for Spring! 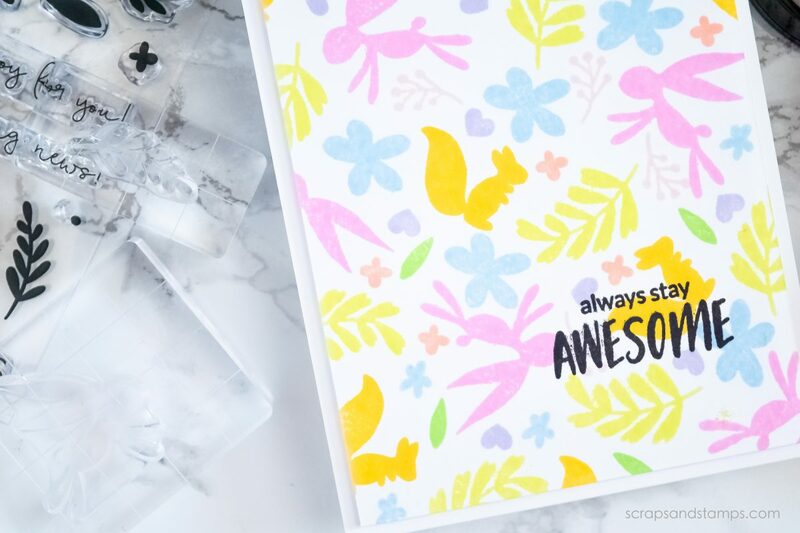 Such a beautiful and fun Spring card, Nicole! You make it look so easy to stamp a background…it usually takes multiples tries for me to get it to look “random” yet balanced. Wonderful card! Love the pastels and cute stamps. Sweet spring card! Love this release, all of it. I absolutely loved the hello die and the papers from the release. Really beautiful. Your simplicity of your card is gorgeous. Great use of the Altenew products. Thanks for sharing your creativity! Love, love these cute images and the color combination that you used. – so fabulous! Love how you used the Spring Fling set. Very pretty with beautiful Spring colors. Great ideas! Your card truly does say Spring! Love it! My favorite of all the new goodies is the Study in Watercolor set. What a beautiful new release! Looking forward to seeing what all the designers have created! Cute card, great idea! All Wonderful cards, colors, and new release! So nice and harmonic background! Sooo colorful and beautiful. Amazing job!. Your card is super sweet, the colours gorgeous. A great new release from Altenew. Such a pretty card! I love the background you created with a great colour combination. Thank you for sharing your awesome work. I look forward to posts from you. Sweetly inked Spring Fling background Nicole! Beautiful card! Fabulous soft colors. I love the Beloved Daisy images and the Delicate Flower Bed set. Such pretty colors! Beautiful card! Ooo, your color choices are perfect for that spring feel. That’s something I really like about Altenew inks that I sometimes forget: not only are they perfectly coordinated for layering, they’re also really nicely coordinated in hue across the different packs. And you laid out all those small images perfectly; it looks like a perfect piece of patterned paper. Thanks for sharing! So cute. Love the colors.